The young James Augustus McEachern (of Scottish descent) joined the Confederacy to protect the Southern lifestyle. In “Caledonia Lost: The Fall of the Confederacy,” he relates his reflections in letters sent to his wife, Victoria. Letter after letter is a revelation of his journey into joining the Confederacy, into war, meeting strong-willed leaders, and, in the agony defeat, the resilience of his one true love. “Caledonia Lost: The Fall of the Confederacy” was selected as a Finalist for Best Historical Fiction for 2018 by Book Excellence Awards. This is the second year in a row that one of Mr. McEachern’s novels has been selected as a Finalist for Best Historical Fiction by Book Excellence Awards. Book copies are available at LitFire Publishing, Amazon, Barnes & Noble, and other online book retailers. William D. McEachern is a graduate of bachelor of arts in religion and psychology from Duke University. 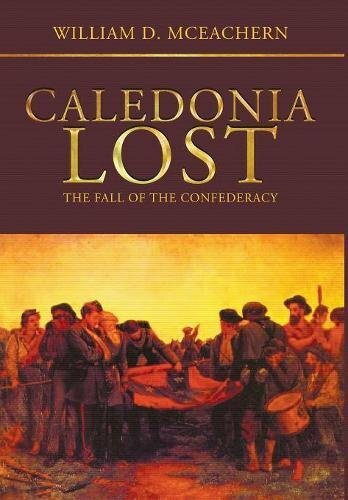 He first wrote “Casting Lots” and became established as a historical fiction writer in his Caledonia series works, “Caledonia: A Song of Scotland,” “New Caledonia: A Song of America,” and this book, “Caledonia Lost” is the third. More information about the author and his work is available at www.wdmceachern.wixsite.com/caledonia/bio or on his new website at www.williamdmceachernbooks.com.